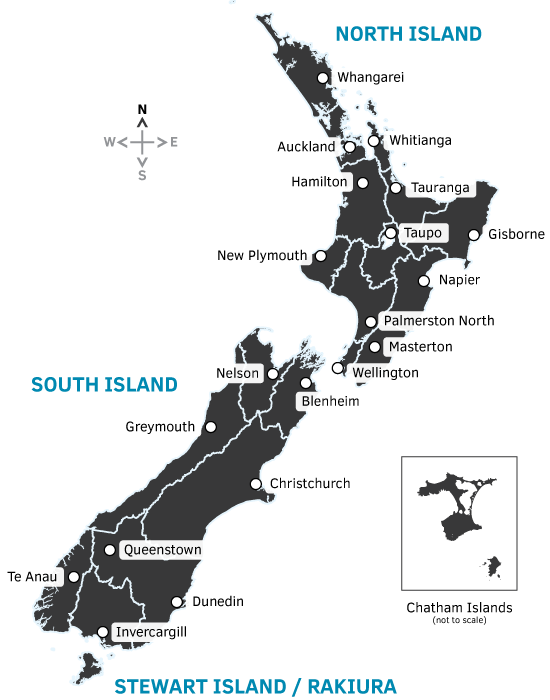 Frequently Asked Questions about travelling with us and NZ. After you've received our travel proposal and informed us you want to book your journey, you'll pay a 10% deposit either by credit card or bank transfer. There is a small charge for credit card payments (2.5), so if you can it's probably best to pay via secure bank transfer. All prices on our website are in New Zealand dollar, so ensure you are paying in this currency. The balance must then be paid at latest 45 days before the tour starts. For more detailed information about how to book, please read here. New Zealand's busiest tourist season is during the warmer months, from around November to April. The peak travel time in NZ is the summer school holidays, from mid December to late January. Transport and accommodation do fill up during these holidays, as Kiwis themselves are traveling during these months, so it is advised to book ahead or travel outside the holiday months. Autumn is also a great time to visit, as the temperatures are still warm, and there are less people about from Easter onwards. If you are a visitor from a visa waiver country, you do not need to obtain a visa to enter New Zealand, but you must carry a passport which is valid for at least another three months after you will New Zealand. Citizens from Australia, holders of a New Zealand or Australian class resident visa don't require a visa either. If you do not belong to the above group, you will need to apply for a New Zealand visitor visa. Check with immigration New Zealand on how to obtain such visa. You can drive in New Zealand if you have a current and valid overseas license or driver permit. You can drive for a maximum period of 12 months from the date you arrive in New Zealand. Each time you arrive in New Zealand you can drive for a further 12-month period. Can I make tour changes? Absolutely! You can make amendments on most of our tours, with the exception being the day tours. You may chop and change as you like. You can prolong a tour or make it shorter, remove,replace or even add some activities time permitting, or you may join a tour at a later stage, only do part of the tour or leave a tour early. It is however advisable to make your amendments before you travel, so that you have your new itinerary ready when you start traveling. Once you are traveling we cannot guarantuee that it will be possible to make more amendments, as it may simply become difficult as accommodation and tours do fill up during the busy season. Why should I choose SouthernJourneys? What if I need to cancel my journey? If you need to cancel your journey, please let us know as soon as can, as there may be penalties involved. If you cancel at least 45 days before departure, we will refund your deposit without ny charge. After that charges may apply. For a comprehensive explanation of our cancellation policy please click here. We do not sell travel insurance, but we strongly recommend that you take out a travel insurance policy. Our packages have been subdivided into a number of categories based on interest, so you can find a good starting point to explore here. Each category has a different focus, and a lot of thinking has gone into carefully selecting the sights and activities we feel will make your journey an unforgettable one. If you can't find what you need exactly, or still don't know how to decide, just drop us a message and we'll be happy to help you further. You can pay in a different currency. When making a payment in different currency you have the option to convert this into NZ dollars at the bank of origin or either bank of destination. When making such a payment you must ensure that after conversion the payment in NZ dollars is equal to the payment amount you've received in your quote. Is my rental car insured? All our vehicles our covered by insurance, however an excess applies of NZ$2000 ($2500 for 18-20 year olds and those on a Restricted/Australian red P1 licence). We offer COLLISION DAMAGE WAIVER (CDW) Insurance to drivers over 20 years of age, which reduces this excess to NIL. CDW may be added to your rental at a rate of NZD$15.00 per day for a minimum 4 day hire (NZD$18.00 for MPV, SUV, Family SUV, Premium SUV, 4WD Sport Stationwagon, Premium Elite & Premier). Slightly higher daily rates for CDW apply for shorter hires and these will be shown on the rental options page as you progress through the online booking process. Note: We do not hire specialty vehicles (MPV, SUV, Family SUV, Premium SUV, 4WD Sport Stationwagon, Premium Elite & Premier) to drivers under 21 or drivers on a Restricted/Australian red P1 licence. STANDARD INSURANCE excess is NZD$2000.00. If an accident occurs while the car is on hire you are liable for NZD$2000.00 or the cost of repair, whichever is the lesser amount. The excess applies to damage to the vehicle or damage caused by the vehicle. This covers damage to both the rental car and third party vehicles or property up to the value of NZD$1,000,000.00. Can I take the car on the ferry? Yes you can. However, rather than including this by default in every quote, you have the option to drop off your car at the depot where you take the ferry, and pick up another car at the depot where you arrive. This way you may save some dollars, as taking a car on the ferry is not cheap. How do I get from the airport to my first night's accommodation? Don't worry, we've got you covered. Private airport transfers are included in the price, so upon arrival at the airport someone will be waiting for you with a name tag and drive you to your accommodation. If you've chosen to pick up your rental car when you arrive, you can pick up your vehicle immediately. You will see the car rental offices in the arrival terminal. Is Wi-Fi available at my accommodation? Yes. All of our accommodation providers have Wi-Fi available. Which phone number should I dial in case of an emergency? The number 111 is used for all emergency services in New Zealand and can be used for police, fire and ambulance. There is a link to our terms and conditions on the booking information page, or you may access them directly here. Can I also book flights with SouthernJourneys? We currently do not offer flights to New Zealand. We only sell services for when you have arrived in New Zealand. If you're still left behind with some more questions, don't hesitate to send us a message for more information. We will be happy to assist you, without any obligation from your part.